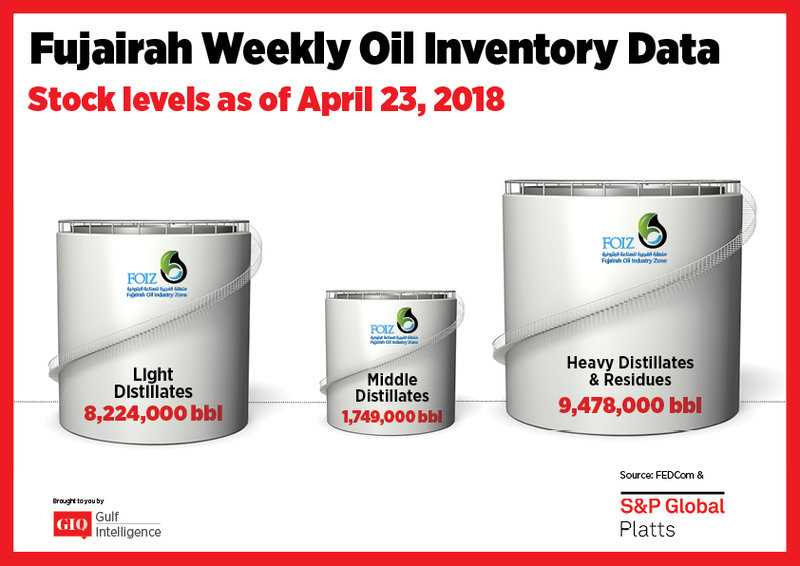 Total oil product stocks in Fujairah stood at 19.451 million barrels as of Monday, up 7.3% from a week earlier, reaching a seven-month high on sizable jumps in light and heavy product levels, according to the latest data from the Fujairah Energy Data Committee, or FEDCom. Stocks of light distillates jumped 11.3% week on week to 8.224 million barrels, an eight-week high, the data showed. Premiums for Arab Gulf RON 95 gasoline have been at $2.75/b since early April, with healthy regional demand in the run-up to Ramadan, which begins mid-May. Kuwait's KPC is seeking 25,000 mt of 91 RON gasoline for delivery over May 5-6 into Mina al-Ahmadi via a tender closing Friday, S&P Global Platts Analytics said in a report Wednesday. Stocks of heavy distillates and residues also rose by 9.9% week on week to 9.478 million barrels. Pakistan State Oil (PSO) made its first purchase since January, buying 60,000 mt of LSFO and 420,000 mt of HSFO for May delivery via tender. With power demand set to rise over the summer, PSO could continue to be active in the spot market over the next few months until August/September. Higher power demand for utility grade 180 CST fuel oil could provide continued support to an already wide viscosity spread, the report said. Bunker demand in Fujairah has been improving over the past week, though buying sentiment is still tentative as market players watch the recent rally in crude prices, it said. 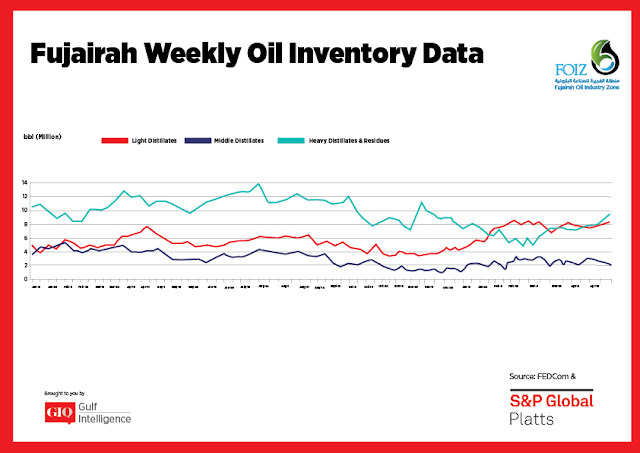 At the same time, stocks of middle distillates fell by 17.5% to 1.749 million barrels, as regional gasoil demand strengthens ahead of Ramadan. Low stocks could also spur traders into stockpiling ahead of the peak summer demand season, traders said. 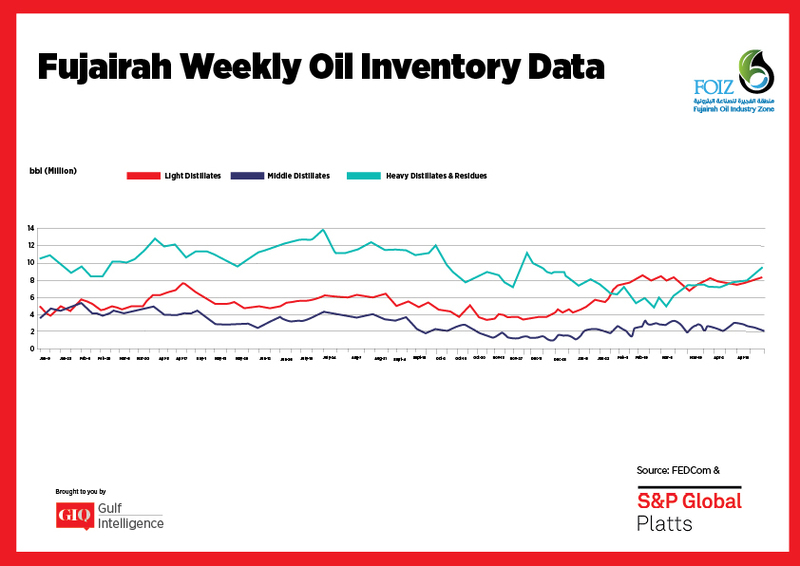 Arbitrage economics are less favorable for gasoil, but the window to move cargoes from Asia to the West of Suez for 10 ppm sulfur gasoil was briefly open last week, traders said. "The arb was open last week when EFS was around minus $12/mt; it is closed now," a trader said Monday. Meanwhile, cross-regional flows helped support jet fuel sentiment. Viable arbitrage economics to divert barrels to the Amsterdam-Rotterdam-Antwerp region and Africa has pushed cash re-grade differentials for FOB Arab Gulf cargoes to a premium of $1.60/b to Mean of Platts Arab Gulf jet fuel/kerosene assessments recently, from $1.25/b at the end of March.